Chris Boardman MBE wears many hats, maybe literally but certainly metaphorically. Not only is Boardman head of the eponymous bike brand, he’s also the nation’s go-to cycle spokesman, dealing out wise words and lobbying government on the behalf of cycling. BikeBiz: Why is the Tour of Britain such a compelling watch? What’s the appeal? Chris Boardman: Cycling is getting more and more mainstream. ITV has invested in it and the BBC cover the Great Britain cycling events so there’s more of it on TV now and that’s significant. The Tour of Britain has been back for a number of years and the pro teams are now used to it – it’s on their calendar and that helps a lot. Then it starts to grow and it’s a great preparation for the World Championships. The race is well set up and organised and the riders like it and tell their teams they’d like to do it again. It’s also an opportunity for young riders to have a go up against world class riders. That makes it really unpredictable and that’s a lot of the appeal for me. The team sizes help – you can’t shut down a race. It’s all about rider tenacity. It’s really grown its reputation. There are top riders and it’s also a great alternative to the Vuelta – if a rider isn’t ready for the full three weeks of that race. It’s a big part of the build up to the Worlds, it’s hard to simulate conditions of riding on the road. And it’s now so well established teams know they can rely on the race. I rode in 98/99 and there was shock among the riders at Britain’s roads. They thought it would be a breeze, but British roads are quite unique. It’s great to see those big names attending, but the winners are often those riders that keep plugging away. Is it fair to say that the Aviva Tour has more space to shine this year – there’s no Grand Depart or Giro on UK/Irish roads this year…Was it overshadowed last year? No, I’m not sure I agree with that. I don’t think it was overshadowed, in fact I think it benefitted from the awareness. That stayed high. It could have fallen flat, but I was pleasantly surprised. The acid test will be next year. I think more events help each other and we are very far from saturation here in the UK. This year’s race will include British Eurosport live coverage and highlights plus ITV4 highlights. Obviously you provide commentary yourself, but how important do you think TV coverage of cycle races is to develop race popularity? TV is part of it, but there are a number of things you need. Media coverage helps attract sponsors…there are about five critical factors you need. Aviva is a big name sponsor and it adds great credibility to the event. It helps it all fit together. Given the recent news from Halfords, it sounds like the summer might have been slightly disappointing for bike sales – has that been the case for Boardman Bikes? We’ve just had our board meeting and we’re actually very happy. You can’t really have constant huge growth but year-on-year we are still way ahead. Summer was quieter than expected, but there’s often a two year cycle to bike sales. A £1,000-plus bike purchase is a big deal for most people. We shouldn’t be surprised if it is quieter after two years of massive growth. And we didn’t have the Grand Depart this year to maybe galvanise sales…? It’s hard to compare this year with last year. Trying to compare with that is a bit foolish. "It’s ludicrous that we have to campaign for cycling"
The ‘how to safely overtake cyclists’ video went down well on our site – what was the response from your perspective? I was really pleased with it. You do get that natural bite back with people saying "what about cyclists obeying the rules" and that’s natural, but fundamentally it keeps cycling in the debate and keeps it visible. I’m concerned now. I am waiting for a response from the Treasury and the Department for Transport after inviting them to spend 48 hours with me visiting somewhere like Utrecht, just a few hundred miles away and seeing how they’ve done it. Then after that they can decide whether investment in cycling with infrastructure is good value for money and what isn’t. But I’m still waiting for repies, it’s very annoying. I like to think I’m quite a logical guy, but the more I think about it the more incensed I get that we have to qualify and campaign for cycling. It is ludicrous. It’s not difficult to see why we have to get behind cycling. 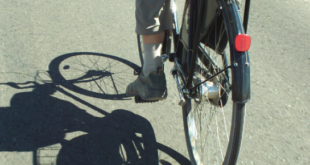 What about the Walking and Cycling Strategy? There’s going to be one, they’ve commited to it so they’re now legally obliged. But it is timetabled for next summer and they won’t know who is going to draw it all together.